Here's another collection from Orly that Victoria Nail Supply posted on their Twitter account. 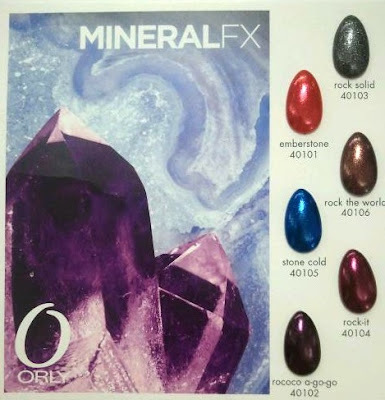 This is the MineralFX Collection that's scheduled for a November release. I just saw this and the Holiday collection on Victoria Nail Supply's Twitter, also. They look promising! Rock Solid looks nice! The others are alright. I'm liking Rock the World and Rock It. Possibly Rock Solid...perhaps I need to englarge the picture..is it a green or a black/gray? If it's green I'm all over it. Looked at it closely..seems black, maybe a little like Sinful's Secret Admirer? I love Rock-it color, so gorgeous! Oooh, these look lovely! Can't wait. I've been in love with Orly lately. Stone Cold is my only preliminary pick, but I can't wait to see the rest swatched! Rock It looks like its been out before for some reason ? I know I have a dupe like color of it from a diff brand. wow, I want at least 4 of them! I love Orly, so excited!